Hi guys! I thought I would share some of my beauty purchases I’ve made last summer. I know it’s long overdue and that I finally got the time to do it. 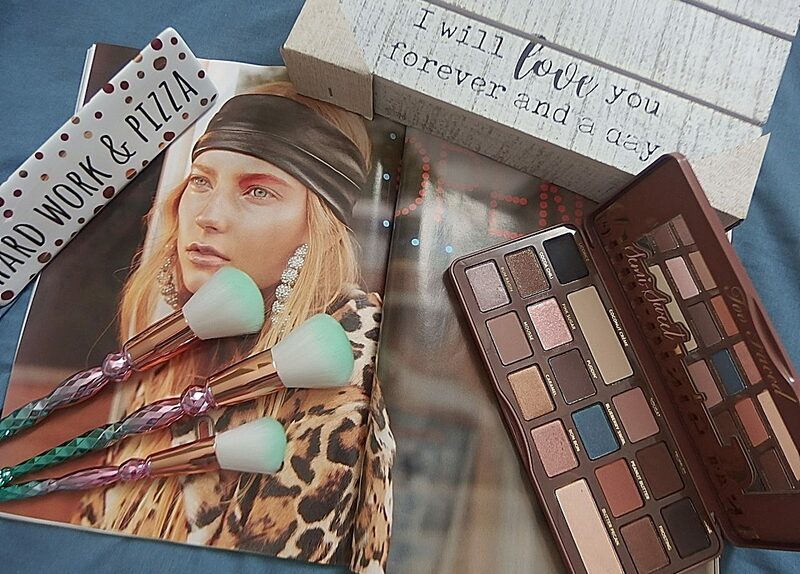 I got a few other bits and bobs to show you but for now we will focus on the products I purchased at Lise Watier warehouse sale with a fraction of their retail prices. This Aurora Collection is by no means Lise Waiter‘s new collection line but it’s fairly new to me. As a matter of fact, this collection was offered in limited edition only a few years back. I picked them because I was drawn to the beauty of this inspired AURORA BOREALIS teal design packaging. So preeetty! This is a stunning collection of six shades ranging from a pale highlight to a deep shimmery plum and midnight blue. The eyeshadows from left to right are Ivory Rose, Pink-Mauve, Violet while the second row are Taupe, Gold and Midnight Blue. The finish on these shadows range from matte to slightly iridescent look. They’re nice and bright but without been too much. I love the color combination of this palette even it’s missing a Green shade. I can go from fairly neutral using taupe and gold to party ready with the other darker shades (smoky eye). Like most Lise Watier eye shadows, I found these a little tricky to work with as the shadows are hard and not very buttery. The pigmentation is decent though and I really like the richness of the colors. But let me know in the comment if you like to see a separate full review post on this palette with color swatch. The colors of these sumptuous powders, embedded with glittering micro-particles, change as they catch the light. One word: WOW! Glittering hints of green emerge from the teal. Did you see that? This is so cool don’t you think? A different effect you see here – a coppery highlights appear in the violet shade. I’m in LOVE with the colors of the collection, especially this violet duochrome! I wanted to mention that the packaging is not only cute but it’s also luxe to have. Lise Watier think of everything and even for a single eyeshadow pot, the packaging comes with a decent size mirror which I really appreciate. A close-up look of the products. I have here a color swatch I picked directly from the pot. Can we just take a few moments to admire these beauty and the glittery effect. Look how insanely pretty the finely milled these glitters are. I want to put it out there that the texture is not buttery or silky soft but it blends out beautifully on the lids. You can wear this product wet or dry. Color swatches of the shades Violet and Teal with just one swipe. You can layer it off to get your desire effect. I’ve been into spring color lately and this Violet shadow is calling my name. I decided to create a one shadow eye look today without any eye primer. For this look, I’m using my finger tips to apply the shadow. Honestly, you don’t really need a brush when applying them. That’s how good they are. Another thing to point out is there’s only very little fallout from these glitters and I didn’t see any creasing from it. If you like to see how I created my #EOTD, click the link to my instagram. A long wear liquid eyeliner with the fine tip brush of my dreams. I love brush liners as they’re quite uncommon, but nothing gives a fine line like them. This eyeliner swatches really nicely, but on, this liner was not nearly as pigmented as I hoped. The color is pretty but due to the iridescent glitter this makes the formula a little chunky. I don’t think it’s terribly bad of an eyeliner but I personally would enjoy it more if it’s not glittery and thus more pigmented. Comment below what is your favorite part of the collection? I love to hear what you think. Thank you so much for stopping by to read. If you did enjoy this post definitely follow my blog. I hope you come to check on my social media down below. In the meantime come and say hi! I’ll see you on my next blog, bye! I love the metallic eyeshadows but I wonder if some of the make up is water based since it’s name Watier… just curious. The packaging looks very pretty and the color pallette looks wonderful. I’d like to try it out for myself! The inside of the eye shadows reminds me of the Estee Lauder Victoria Beckham collection. Such a pretty packaging!! !